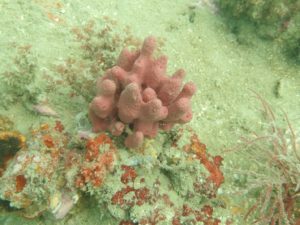 Once considered ‘sea vegetables’, sponges are animals made up with simple arrangements of cells that lack organs. 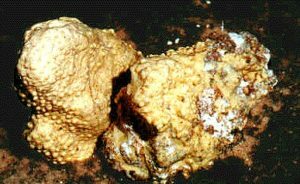 They grow from tiny encrusting colonies a few cells thick to massive boulders with a dazzling array of form and color. Some species are living habitats with numerous commensal anemones, polychaete worms, brittle stars, crabs, shrimps, and nudibranchs living deep within their protective canal systems partaking of the food and oxygen-bearing currents that are pumped throughout the colonies. They provide shelter for smaller organisms in the tank. 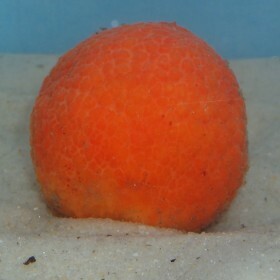 Because sponges are natural suspension feeders, they help filter aquarium water. They thrive on small amounts of brewers yeast. 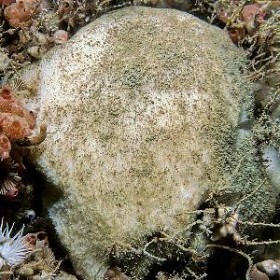 Generally, sponges are best kept in cooler water, 60F to 70F. P-10 FINGER SPONGE, Aplysina fulva, a loosely branched bright yellow species often covered with brittle stars, they also provide good cover in the aquarium. Size: 12-18 cm. 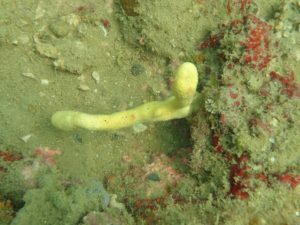 P-20 BORING SPONGE, Cliona celata, a bright yellow, corn-cob shaped sponge that exhibits pumping of water through prominent osculum. 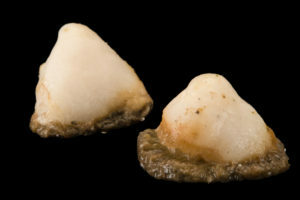 In juvenile stages, the Cliona sponge hollows out a system of cavities and canals in the dead shell, removing small fragments of material with amebocytes. Adult Cliona provides shelter for other aquarium animals and makes a striking focal point. Also called “Sulphur sponge.” Size: 9-12 cm. P-21 CLIONA SHELLS, Empty mollusk shells riddled with tiny round holes of boring sponges are selected to demonstrate the process of how the shell is broken down into rubble and calcareous sands. 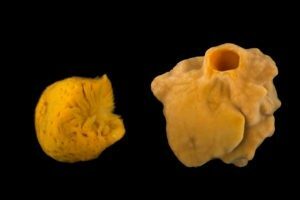 The eroded and deteriorated shells are easily broken apart to demonstrate the internal encrustation of yellow or red sponge tissues. 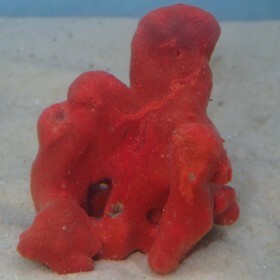 P-30 RED BEARD SPONGE, Clathria prolifera, a brick red encrusting, lamellate sponge. Microciona along with Cliona celata, the boring sponge, is used to demonstrate cellular reaggregation, However, there appear to be significant biochemical differences between the Gulf of Mexico form and Microciona prolifera at Woods Hole. Some researchers have found the aggregation of the Gulf form to be superior to the North Atlantic red beard. Size variable: 2-4 cm. 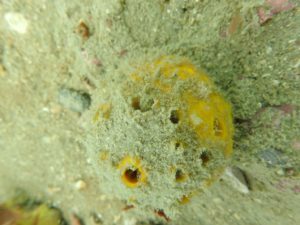 P-40 LOGGERHEAD SPONGE, Spheciospongia vesparium . 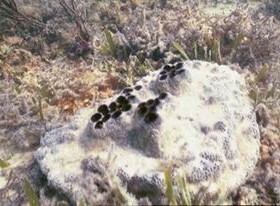 There are two color forms of this species: Spheciospongia vesparium pallida a bright yellow, and the typical black coloration. Spheciospongia vesparium Excellent for demonstrating liquid transport through flagellated chambers. 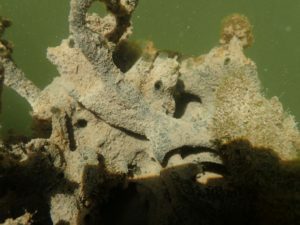 Spheciospongia is host to the pink snapping shrimp, Synalpheus longicarpus, which because of its modified form and habits is a good illustration of specialization and commensalism. P-50 HERMIT CRAB SPONGE, Pseudospongosorites suberitoides, is a hardy, commensal orange and green sponge that engulfs hermit crabs or snail shells, building up layers of sponge tissue called “false shells.” When the sponge colony is small, the crab or snail moves freely around the tide flats, but when Pseudospongosorites grows too large the host becomes a trapped prisoner. Paguristes hummi, the filter-feeding hermit, or Cantharus cancellarius, the ribbed snail are the original hosts. Size: 3-6 cm. P-60 OYSTER SPONGE, Stelletta grubii, a round yellowish sponge honey-combed with the small commensal oyster, Ostrea permollis. Stelletta usually survives well in aquariums. Sporadically available. Size: 10 cm. in diameter. P-70 ORANGE DEVIL’S FINGER, Axinella polycapella, doesn’t look like an ordinary sponge with its thick, fleshy orange fingers rising from the aquarium floor. Axinella with its core of densely packed spicules demonstrates distinctive axial specialization. A single sponge provides abundant material for cellular reaggregation demonstrations. Size: 20-30 cm. 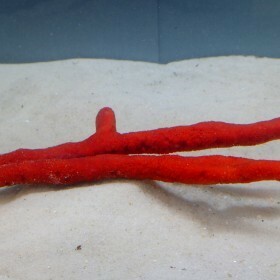 similar to the orange devil’s finger sponge. This sponge tends to be smaller in size than the orange devil’s finger. 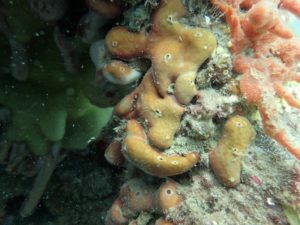 P-90 RED ROCK SPONGE, Xytopsene sigmatum, a bright orange, amorphus sponge with conical elevations, living attached to Tampa limestone outcrops. Xytopsene can be used for reaggregation. Size: Variable, 6-10 cm. P-102 CHICKEN LIVER SPONGE,Chondrosia or Chondrilla sp., this sponge’s shape and slick surface are strikingly like chicken liver, although Chondrosia is much firmer to the touch. Commonly found growing over rocks, seagrasses, and dock pilings. Size: Variable, 5-8 cm. P-104 CRUMB-OF-BREAD SPONGE, Halichondria corrugata or related species; always growing on our floating docks. Halichondria has a symbiotic green alga in its tissues. It produces a large amount of spongin and is excellent for reaggregation studies. Halichondria is also good for demonstrating commensalism: multitudes of small pink anemones, polychaetes, and porcelain crabs live in the canal system. In the aquarium it starts growing rapidly into a thin layer, incorporating gravel, rocks, and shells into the colony. Size: 1 cm. and larger. It is the original source of Okadaic acid, an algae toxin. 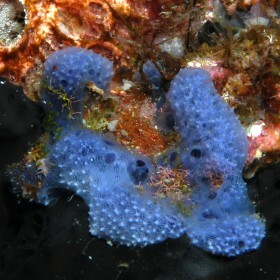 P-105 BLUE SPONGE, Dysidea sp., a purple bluish sponge that grows in seagrass beds, and has the unique ability to extract nickel from the seawater and concentrate it in its tissues. Although it has a definite shape, Dysidea will adhere to the gravel in your aquarium, at any angle. Excellent for reaggregation experiments. Size: 4-6 cm. P-109 YELLOW BALL SPONGE, Cinachyrella alloclada, a bright yellow sponge that is perfectly spherical. Its hardiness is truly amazing, it can be buried completely in anaerobic sediments and Cinachyra still survives. Withstands wide temperature variation and seems to last indefinitely in the marine aquarium. Size: 3-6 cm. in diameter. 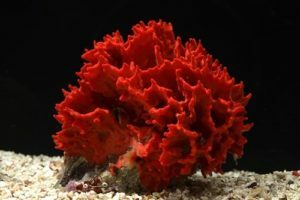 P-113 PINK SPONGE, Igernella notabilis, a spectacular color for the aquarium. 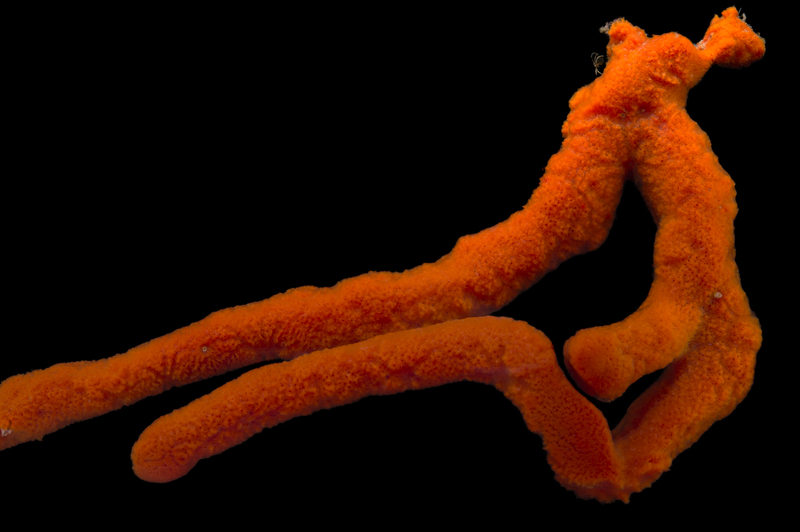 Igernella is a fleshly pink sponge that grows on rocks. Sporadically available. Size: Variable, 10-12 cm. 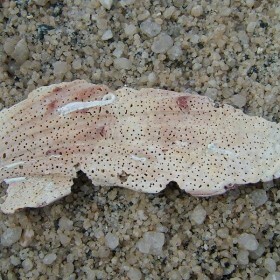 Panacea walking sponges (Tetilla laminaris) at Gulf Specimen Marine Lab and Aquarium. AS-17 SPONGE ASSORTMENTS: A variety of sponges from the specimens listed below.